Needless to say, with talent like this, we can look forward to the day when, according to the internal Pentagon memo quoted by the Times, Afghanistan will become “‘the Saudi Arabia of lithium. '” Coming your way soon, yet another obscenely wealthy beacon of authoritarianism and Islamist terrorism. But that’s the future, and of course the future could turn out otherwise. What is interesting for the moment is how the conversion of Afghanistan into a mineral extraction colony for multinational capitalism is being framed both verbally and visually. This is the photograph that the Times appended to their article. 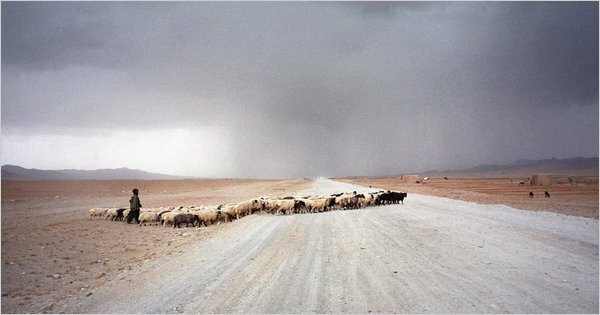 It is one of many amazing images of Afghanistan by Tyler Hicks, and I believe I’ve seen it some time ago. In short, this is not Tyler Hicks working up the mineral story, but rather an appropriation of the image to frame that story. As such, the implications are clear: there really is nothing and almost nobody there; the pastoral herders who are there are incapable of the capital- and technology-intensive development necessary to convert the rocks to wealth. Where have we heard that before? Well, in the American West. Let me suggest that the idea that Central Asia is a new Wild West has been present often enough in the visual coverage of the American military occupation of Iraq and Afghanistan. 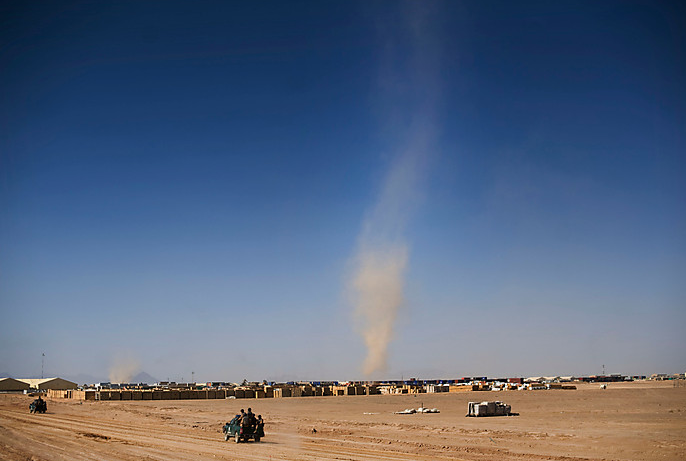 This photograph was part of a slide show at the Washington Post on Marine efforts to secure the area around Marja in southern Afghanistan and train Afghani police at “Camp Leatherneck” there. This shot was the last in the series. Don’t say there are no more frontiers, because this is an image of a frontier outpost. Photographs by Tyler Hicks/New York Times and Andrea Bruce/Washington Post. Waking up to realize that all of us, even the President, are in the control of this Corporate Resource-Hogging Monster has been disgusting. Next, we’ll see the small-pox ridden blankets given out to the natives. In my mind, this is only a Pentagon propaganda ploy to boost Mission Impossible into Mission Infinity. Hey, dilithium crystals have to be made from something and we can’t expect to keep powering our starships with petrocarbons forever!